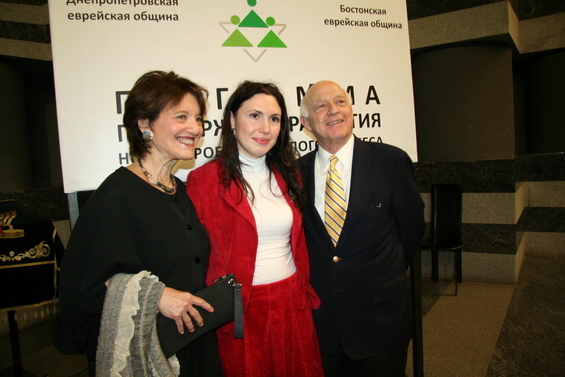 For more than eighteen years, JCRC and CJP have pursued an enduring partnership with the Jewish Community of Dnepropetrovsk, Ukraine. Extending to agencies and individuals throughout the Greater Boston area, the Dnepropetrovsk Kehillah Project has built relationships between the communities that have brought Boston expertise to Ukraine in the areas of social services, social justice, medicine, education, and special education, just to name a few. It has also brought Boston the great honor of witnessing—and participating in—the miraculous rebirth of Jewish life in Ukraine. In 2007, Rabbi Shmuel Kaminezki, Chief Rabbi of Dnepropetrovsk, invited us, along with Bob and Doris Gordon, to attend a meeting of the Dnepropetrovsk Community Fund in Jerusalem and then to fly to Dnepropetrovsk for Yom Kippur Services at the Golden Rose Synagogue. Remarkably, this was the first trip to Jerusalem for many of the Fund members and their families. Space doesn’t permit us to describe the extraordinary few days we spent with them in Jerusalem (being at and inside the wall on Erev Yom Kippur, the Kapporot ceremony, the unique visit to Yad Vashem), but the culmination of our time together was Yom Kippur itself. Here we were at the glorious and grand Golden Rose synagogue, at an ordinary orthodox service running from roughly 8:30 A.M. to 2:00 P.M., with a two hour break and then back from 4:00P.M. until about dusk, the synagogue jammed with people, males and females separated, people milling around, davening, talking with one another, trying to keep their kids under control. And yet, it was very special – an event that would have been unheard of less than 15 years earlier, a Yom Kippur service that gave us a glimpse of the lives of our grandparents’ generation, a rich tapestry of pre-World War II, pre-Communist Eastern European Jewry, filled with the familiar tumultuous warmth and feeling that, for us at least, gave rise to feelings of great comfort and joy. So Yom Kippur in Dnepropetrovsk is a continuation of a tradition, broken for over 70 years, that is flourishing once again – an affirmation of our heritage and the eternal strength of Judaism.